As a camp director, I sometimes encounter parents of younger children who insist their child is “not ready” for sleepaway camp. But after discussing a bit more, it becomes apparent that the child is actually good to go and that it’s really just the parent(s) who is not ready to have their baby leave the nest. Now, it’s definitely our job as parents to seek the best for our children. But, it doesn’t mean that a parent needs to be the sole, direct controller of that growth. Think back to their first day of school. For some of us as parents, it was challenging to drop them off at the schoolhouse door or put them on the bus that first time, but we knew that we had to, because it was critical for their academic development. Regarding their further character and personal growth, letting them have that first-time camp experience is arguably even more important. We don’t want to rob them of valuable developmental opportunities just because they’re little. Biologically and emotionally, it’s generally easier for a 7-10 year-old to have a first-time camp experience than it is for a 10-13 year-old. But often parents wait until their child is 10-13 because the parents feel more comfortable then; however, they’re actually confusing their own (lack of) readiness with that of their child. Sometimes it’s because the parent worries that their child might miss them or miss home. Sometimes it’s because the parent worries that their child won’t take care of themselves properly– that they’re somehow incapable or can’t do things on their own. Sometimes it’s because the parent worries that the parent will be worried! Yes, missing home happens…but it’s not only normal, it’s part of the positive character development engendered by a camp experience; the child learns that s/he can work through a challenge and emerge stronger for it. Yes, when we’re not around, our children may do things differently–like maybe not brush their teeth specifically how we like it, or make their beds with military precision; however, having parental eyes on a child at all times isn’t necessarily good for them. Yes, we might worry when they’re not at home, but the job of a good camp with good counselors is to care for kids when parents aren’t there; counselors are trained to foster independence and growth; 24-7, the staff live and play and work with kids; they get to know the fantastic little human beings entrusted to them. We have to avoid projecting our own fears onto our children, and get out of their way so as not to limit their potential. If a child is ready for camp but we’re not (yet), we might have to get over ourselves (with support) and do what’s best for them. Most will agree that the first time for a significant away-from-home experience shouldn’t be at age 18 or older; but why pick 10-13 or 14-15, when we can make it easier for them at 7-10? The middle childhood years are an ideal learning window to internalize strong positive character traits. Independence: Without parents in a direct, managerial role, kids are able to build confidence in their capabilities through daily opportunities to be self-sufficient, i.e. choosing clothes, self-care, showering, etc. Responsibility: They foster their sense of responsibility along with their growing independence. Autonomy: They achieve perceived freedom from control (yet are guided in physically and emotionally safe ways). The empowerment gained by attending Kupugani early on strengthens them against harmful societal pressures during preteen years. They can explore and develop their identity before societal pressures are able to negatively impact them. Children who feel good about themselves are more able to resist negative pressure and make better choices. Earlier experiences with guided activities and conversations helps combat negative gender (and other) stereotypes. Controlled opportunities for safe, managed risk leads kids to be more confident when future challenges arise. Missing home (aka “homesickness”) is easier to redirect with younger children. Young children are more easily distracted so as not to focus on missing home for an extended amount of time; staff are skilled at redirecting homesick children to interesting activities. 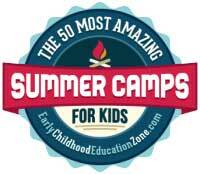 Young campers can be easily kept engaged in the busy schedule of camp. How can you miss home when you’re climbing a limestone rock wall, enjoying a lively game of gaga, or singing fun songs with your friends? There is greater opportunity for them to form friendships with children of varied backgrounds, because their social attachments are largely based on proximity, not identity. When identity is more fluid, kids can make friends with nearly anyone. Camp kids are not limited by home community or geography in their friendships. They can renew and deepen friendships over years with camp friends. Transitioning from electronic media is easier for younger children. Giving up phones can be initially stressful for many preteens and teens. Younger children do not have the same attachment to social media. Children in this age group tend to prefer face-to-face interaction, so camp is perfect for them. Younger campers can embrace new older role models more easily. Kids in the middle childhood stage are more likely to look to perceived authority figures for help and guidance than are pre-teens. They spend each day interacting with staff of various backgrounds, serving as positive role models for strong, confident adults. This age group can be led to gain independence without rejecting older leadership. Younger campers are biologically more adaptable to to camp life. Young children generally adjust more easily to new surroundings. They usually have more energy and enthusiasm for the active camp lifestyle. Youthful curiosity gives them an enhanced appreciation for nature. Children have only one chance to be 7 (or 8 or 9); let’s make it the best for them! The ability to return for many years provides the opportunity for creating a second home at Kupugani, becoming family and carrying on camp traditions and culture. They can emulate multiple-year returners–some were young campers returning each camper summer, and eventually becoming staff members. Multiple-year returners enjoy perks like trips and free camp swag!